It's not quite December yet and this morning the temperature felt like -16 degrees Celsius in the GTA. Brrrr. One exceptionally chilly February snow day years ago I industriously went out with my camera and took some photographs of the excessive amounts of snow in the area. Well, I took some snaps until either my camera or the batteries stopped working because of the cold. Anyway, I'm actually pretty much the same way; I don't function well in the cold. I was probably only outside for about three minutes this morning before my eyes started streaming. Generally my whole body tightens up, wanting to close in on itself in a futile attempt to keep warm, whenever I'm out walking in winter. Maybe my genetically Irish cells would naturally prefer more moderate temperatures?? I don't know. But I'm happy to be indoors again and happy that it's a gorgeous bright day. When the days are so short we really need the light whenever we can get it! 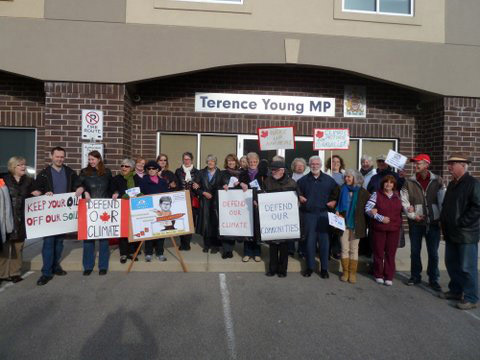 I'm home from the office unexpectedly early this morning and because I have this bonus time I want to share a few lovely reviews my books have gotten lately, as well as photos the organizer of the Oakville Defend Our Climate rally sent along of our local protest. 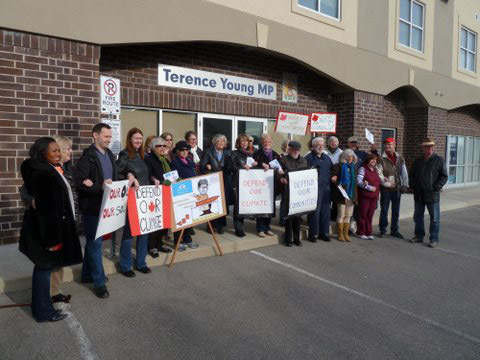 I'm the one with the Canadian flag style sign. And the fight continues! In Washington-based Center for Global Development's assessment of 27 wealthy nations Canada came dead last when it comes to environmental protection. Also, for the second year in a row Canada has placed near to last in Germanwatchs Climate Change Performance Index with only Kazakhstan, Saudi Arabia and Iran behind us. We have a hell of a lot of work to do to dig ourselves out of this hole! I can't tell you how thrilled I am that CM Magazine has called Tomorrow Highly Recommended and very much worth seeking out. Just thinking about it could almost keep outdoor cold from hunching me into my ordinarily tense posture. And now I'm going to get down to writing while there's still some sun in the sky to power my efforts. Happy Friday!